For those who are considering purchasing a tactical flashlight, there are many features that you will need to consider and evaluate for your needs. This is the checklist that you should find helpful while buying the best in the market. There are two settings essential to all flashlights of this type. The first is a blinding beam of at least 130 lumens and the second is a low power light of 5 to 15 lumens to navigate in the dark. Brightness does not necessarily translate to beam distance, so you’ll want one that can illuminate at least 500 feet in front of you. However, it should be seen by those at least 1000 feet or more away if you are trying to call attention to your position. Again, 130 lumens is the minimum as it puts out a blinding light. However, you may want to go with at least 300 lumens depending on your line of work. The flashlight for law enforcement will need a dazzling beam to find and disorient potential suspects. You’ll want a minimum run time of two hours for the brightest setting and at least 100 hours on the low setting for navigation purposes. LED is the only one to choose as it is far more impact resistant, versatile, and durable than standard incandescent lights. Plus, LEDs can last longer given the number of different settings as well. Here, your choices are using a rechargeable lithium battery or standard AA or AAA batteries. 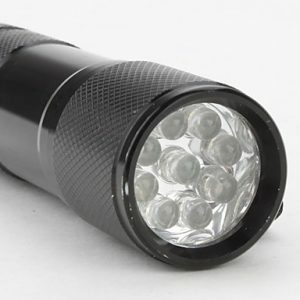 While the rechargeable flashlight is arguably cheaper because it does not require batteries, going with standard AA or AAA is better because you can carry spares if you are still out in the wilderness. Most flashlights of this nature have at least two modes, although some models will offer three or more depending on their uses. A very bright and low light mode is the most common. However, some variations include flashing, strobe, and a red light mode so that it doesn’t interfere with night vision equipment. This is hard to measure because all flashlights of this nature are designed to be highly impact-resistant because they may be used as a weapon or designed to break glass. Therefore, the casing will need to be crafted from aluminum or another high impact resistant material. Most flashlights of this nature are water resistant up to 60 feet because they will need to hold up against the elements. The military stresses waterproofing at such levels because of the different environments. The typical army flashlight is crafted with an aluminum casing which resists corrosion and is very tough. You can also get one with a hard polymer casing that is reinforced. Remember, you may need to defend yourself with the flashlight, so aluminum is the preferred choice. The tactical or military flashlight you choose will need to have all of these attributes to get maximum use out of your investment. The good news is that most flashlights that meet all the requirements are relatively inexpensive and will last a long time. Get to know our top picks for the best tactical flashlight.